The famous scientist, Galileo, first saw Saturn through a simple telescope in 1610. 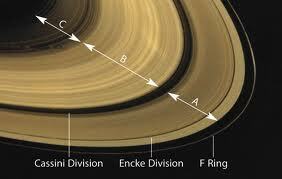 He thought the rings were two small planets or bodies of matter, in addition to Saturn’s large body. Today, we know that Saturn is surrounded by yellow and gold rings, which are separated by a 3,000 mile divide, known as the Cassini Division. Scientists believe the rings are made mostly of ice water. All About Saturn: Saturn has 52 discovered moons. Saturn, like Jupiter, is made mostly of hydrogen and helium. The planet has severe wind storms and the wind blows more than 1,600 feet per second. That’s pretty fast. The strongest hurricane winds on earth reach only 360 feet per second. Saturn is surrounded by yellow and gold rings, which are separated by a 3,000 mile divide, known as the Cassini Division. Scientists believe the rings are made mostly of ice water. Saturn has 52 discovered moons. There are probably more waiting to be found. Some of the moons are as big as planets. Saturn has a strong magnetic field. It is the second largest planet after Jupiter. A year on Saturn lasts 10,759 days, but a day is only 10 hours and 39 minutes because Saturn spins quickly. If you weigh 60 pounds on Earth, you’d weigh 43 pounds on Saturn. 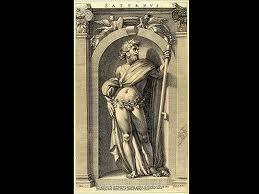 Saturn was named for the Roman god of Agriculture. A video documentary explaining facts about Saturn. Question 1: What is the temperature on Saturn? Answer 1: Saturn is a long way from the Sun. Its temperature is about -288 degrees Fahrenheit. Question 2: How did Saturn get its name? Answer 2: Saturn was named for the Roman god of Agriculture, son of Uranus and the father of Jupiter. Question 3: What are Saturn’s rings made of? Answer 3: Saturn’s rings are made up of ice and rock.The particles can be tiny like the size of a grain of sand or a big as your house. Question 4: How many moons has Saturn got? Answer 4: Saturn is the big winner with the most moons, Saturn has 53 moons. Question 5: Is Saturn’s atmosphere like the earths? Answer 5: No Saturn is made up mostly of gases, it has plenty of helium. This is the same gas that is used to keep balloons floating. The earth is made up mostly of rocks while Saturn as mentioned above is mainly gases. Did you know Saturn could float on water because of the gas composition. Question 6: Is Saturn bigger than Earth? Answer 6: Saturn is the second largest planet in our solar system, Jupiter is the largest. Saturn is massive compared to Earth, so much so that the Earth could fit inside Saturn 764 times. 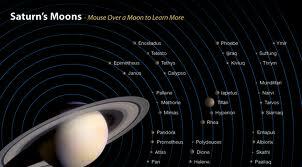 Enjoyed the Easy Science for Kids Website all about Saturn info? Take the FREE & fun Saturn quiz and download FREE Saturn worksheet for kids. For lengthy info click here. Declan, Tobin. " Fun Saturn Facts for Kids ." Easy Science for Kids, Apr 2019. Web. 21 Apr 2019. < https://easyscienceforkids.com/all-about-saturn/ >.